Pictures in this gallery are of tickets for enthusiast railtours and open days of various sorts, including programmes, brochures and flyers where I have them. These pictures are published for pleasure/information/research purposes only and are not for sale or copy under any circumstances. Information in captions has been researched as thoroughly as possible but its accuracy cannot be guaranteed. 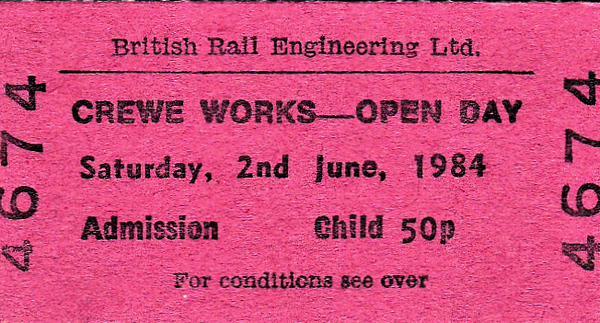 OPEN DAY - CREWE WORKS, 1984 - Open Days were held quite frequently at Crewe Works and, on any Saturday afternoon, for just a few pence, it was possible to go round anyway, supposedly accompanied by the gateman but often not! This event was held on Saturday, June 2nd, 1984. 08416, 20032, 20060, 20140, 20192, 20196, 20058, 20073, 25306, 33048, 37107, 40020, 40073, 40107, 40131, 40183, 40191, 45053, 46026, 47225, 47451, 47470, 50007, 56133, 58008, 81001, 81009, 81014, 85011, 85027, 85033, 86002, 86322, 87006. 81012, 81018, 85003, 85007, 85034, 86032, 86204, 86233, 86242, 87013. 47100, 47405, 47415, 47570, 47612, 56132, 84008. 40101, 40115, 40139, 47470, 81016.